In this episodeBen Parr, former editor of Mashable, shared his insights on his book Captivology and focused on three stages of attention and triggers that can capture the attention of your audience. Parr states that all three stages must be addressed in order to achieve high success in social media marketing and there is no such thing as skipping stages. The ultimate goal with his model is progression. He encourages social media marketers to create content that progresses the reader’s attention from the intermediate stages to the long stages of attention. This can be through simple status updates and photos or through robust advertising campaigns. Having your advertisement seen and noticed by the average consumer is very important. However, what is even more vital to small business owners is turning the viewer into a customer and dedicated user which takes time. The attention captivation triggers explain why and how we draw and retain attention for our passions, projects, and ideas. The three triggers he mentioned in the podcast were reputation, disruption and mystery. We pay attention to someone who is considered an expert in their field. Parr suggests showing your expertise by bringing in outside experts to back up your claim. He believes it helps when trying to get more attention. We focus our attention on things that seem out of place or something violates our expectations. We have all seen magazines advertisements that have been strategically placed upside down. This cell phone company has taken this strategy to new media. We have the tendency to pay attention to incomplete thoughts and tasks and want to understand and find out why something isn’t finished or complete. The phenomenon is called cognitive dissonance. Cliff hangers give us something to seek and search for. Research shows that when we encounter uncertainty we spend considerable energy trying to reduce the uncertainty, which in turn makes it memorable. This is why many online news organizations use what is referred to as “click bait” to make us click on a news story to find out more. Though many people do not like “click bait”, it is still an effective way to get people to temporarily engage with your content. I recommended this podcast because Parr gives specific information and recommendations that can be adopted into any business’ social media marketing strategy no matter how large or small their budget is. In the podcast, Stelzner and Part show how business owners can use three triggers (reputation, disruption, and mystery) to build and maintain an audience. 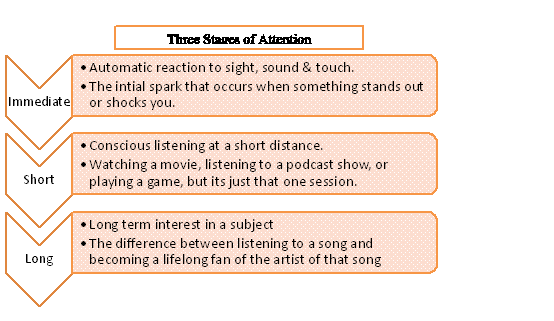 Parr also focuses on how businesses must focus on the three stages for attention in order to connect with consumers. Within the podcast, both Michael and Parr relate these abstract topics to real-world examples that help give the concepts some clarity and drive the points home to business owners and social media marketers. Although the podcast does have some useful information, it can be a little vague in areas for listeners who are not well-versed in social media marketing. I had to do some additional research outside of the podcast episode to understand some of the topics presented in the podcast, and I wish they took a second to help the listener understand these things. However, this podcast episode was still a valuable resource because it reminded us of three very specific items we need to focus on in our social media marketing.